You can find the Saxon Security in each police station of the Free State. This is an example of cooperation citizen and police .This kind of collaboration offers reliable women and men who are willing to support the police by obeying the public law and order. They take responsibility for the domestic security and so the residents benefit of their job. should be at least 18 years old and have got good reputation. possess the O-level or a certificate in vocational training. should be reliable and offer a guarantee that they will always be loyal supporters of our democratic order. have to be physically fit for the duty. have passed further education- and training courses to acquire the necessary basic knowledge in law and special knowledge. 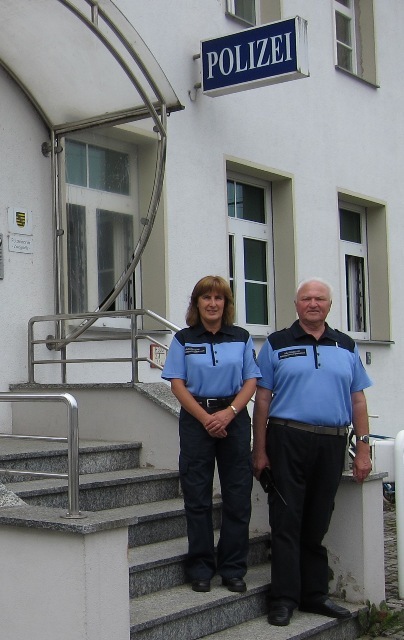 The members of the Saxon Security support the police station, especially by patrolling in public. They contribute towards more safety and that feeling among the population. 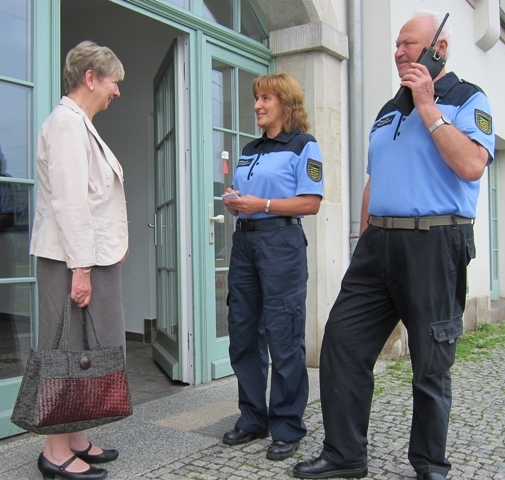 In the case of any suspicious incidents they inform the local police station or they act according to their authority. The citizens inform them about problems in order to forward the information to the police station. the right to act in self-defence and emergency aid for other residents. question persons to get pertinent information. determine the person' s identity who radiates danger or disturbance. For this reason the person can be stopped and can be asked for the particulars and, in addition, can be asked to hand over the documents for checking it. If it is impossible to check the identity on the spot, the person has to follow to the police station. give out an ejection against a person who radiates danger or disturbance. secure items in order to beware the owners of loss or damage of their property. The members of the Saxon Security act by being perceptible to everybody. 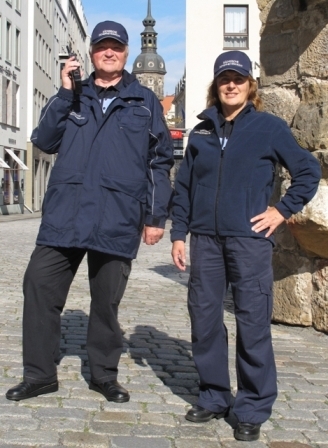 They wear dark blue jackets with the inscription "Saxon Security" on, a baseball hat and a blue polo shirt. They have contact to the local police station by radio and carrying for their on safety official-registered irritating gas. The members of the Saxon Security have got an identity card with them for being authorized to act. The selected applicants of the Saxon Security are trained for their further tasks. The training is organized and held by the local police divisions. The applicants are taught the special topics of law within 60 lessons, they learn the tasks and the duties and acquire practical experience for their future job. 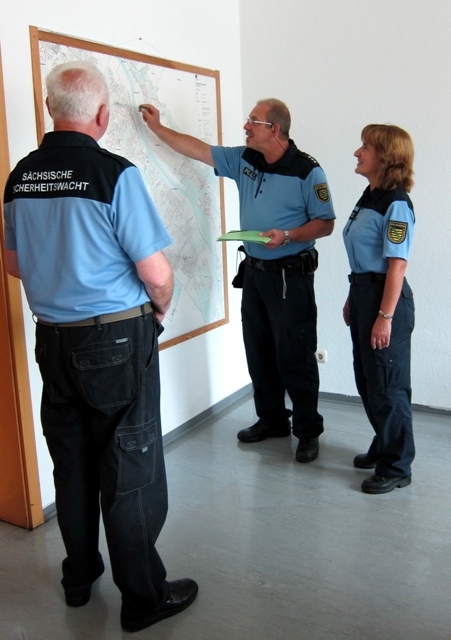 At the end of the training course there is an interview and afterwards the participants are appointed as members of the Saxon Security and allocated to a police station. 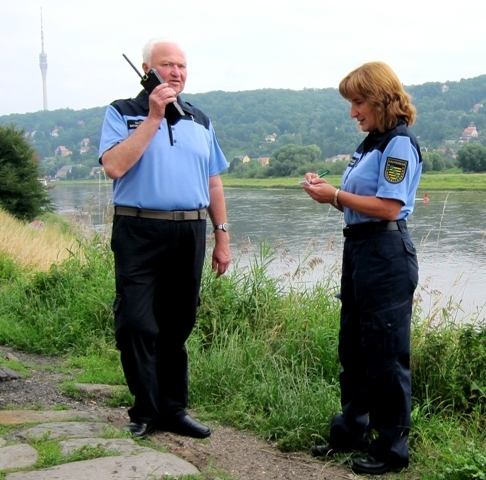 The members of the Saxon Security get 153 euros during their training, but only once paid as compensation. They will get further education with the local police stations in order to be trained for their operation. schools, leisure centers and children playgrounds. A 40-hour duty per month is allowed.The members of the Saxon Security earn 5.11 euros per operation unit as expense allowance.